Small size and excellent picture quality is what sets this camera apart from the rest. With 600 lines of resolution and excellent color reproduction it performs just like a full size cctv camera. Comes with a 2 year warranty. 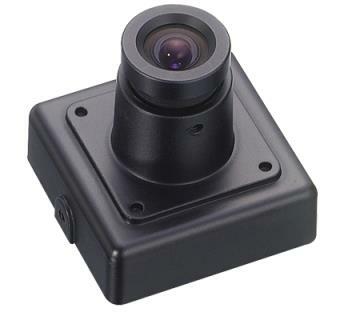 High resolution Color camera with SONY 1/3“ Super HAD CCD sensor in mini metal case. Built-in anti-alasing and IR-cut optical filter. Furnished with DC power cable and video cable. DC type, low power consumption. Ideal for covert surveillance. Ships with optional 12VDC Power Supply, standard power/video leads, mounting bracket and choice of lens.